I trust I find you in excellent health and feeling awesome. Today, I wanted to talk to you about the brain! Yes, the brain. Wonderful organ that can serve us immensely but due to the fact that it’s been designed a certain way it can also jeopardize our efforts to live to our fullest potential. Let’s get down to the anatomy of brain for a second so that in case you are not yet aware, you can completely grasp what happens up there and how you actually have the power to get in the flow anytime you want! The reason why I’m writing about this is because as you know I have really started to get into the mechanics of how thoughts and emotions influence our physical health and what I’m learning I find truly fascinating. My hope is as always that it can help you too on your path to creating your best life. All right, let’s get down to it, or rather up to it. Our lovely brain is truly influenced by negativity each and every day, negativity from the past, present and the future. Our negative beliefs from the past are constantly running in our mental energy field and in consequence affect our brain and our entire body. 1. 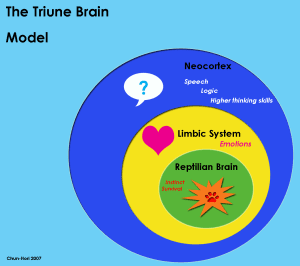 The oldest part of the brain, the primitive part, you might have heard of is called a reptilian brain, it comprises the brain stem and cerebellum. This part is responsible for storing what is conditioned, automatic and deeply hard-wired. 2. In the middle we have mid-brain, also called the limbic brain. This part is responsible for FIGHT-FLIGHT-FREEZE response. It is what is also called our emotional brain, this part holds all our subconscious beliefs. Let’s say for example you experienced some traumatic event when you were a child, it could be an accident, abuse, witnessing your parents divorce etc. The emotions got really deeply rooted in your brain and now your limbic system will be very easily triggered into what is called the stress response. I’m sure you have experienced that many times, that for some consciously inconceivable reason you get really angry, sad or depressed and you have no clue why. There you have it – your subconscious computer is replaying the old recorded reaction/emotion. 3. The third part of the brain, the newest addition to it is called – the neocortex or the forebrain. This is considered to be the seat of our conscious awareness and higher thinking. Here is where your power to take over from the older parts lie. Within the neocortex there are frontal lobes which give us that power, the power of free will, the power of choice, creativity and truly distinguish us from other animals. So, now that we have that covered, what stops us from being in the flow and how can we get back into it. First of, let me introduce you to the amygdala! This little piece of flesh sitting in our limbic ( mid ) brain gets to decide whether we are in danger or not. Now, when we were hanging around wild animals thousands of years ago, when we were living in the wild it was really useful, otherwise we might have gotten eaten. However in modern times the amygdala gets triggered ALL THE TIME and what happens to each and every one of us, unless we get conscious, we get to living in chronic stress response almost 24/7. This really is unfortunate and I must tell you, it is also sadly abused by unethical businesses who use this mechanism to manipulate us into FEAR all the time. We keep on buying unnecessary stuff, we keep on building unnecessary defenses and certainly we are getting sicker and sicker because our amygdala gets triggered over and over and over again. Our systems don’t even have time to recover properly. Let’s say you are watching a horror movie, you keep on stressing yourself out by really getting into what is going on the screen, you keep on triggering the amygdala and you get into FLIGHT FIGHT or FREEZE response. Normally when you stop watching the movie you would just get your awareness back, use your neocortex, your new brain and truly understand that it was just a movie, no point stressing over it, you would let it go and relax. But….let’s say in between you will see commercials that inform you about some disturbing stuff or you might watch the news after you finished your movie, when you look at the news these days you will stressed over your ears! Now, imagine that this is happening day after day after day. And this was just a trivial example of what can stress you, both, you and I know that life tends to be much more stressful than that! So….now that you know there is a mechanism to it, what can you do to stop that, shake the stress off and get in the flow? Here is a great technique I use to get centered and truly feel relaxed, get back into the flow. Sit down and relax, focus on your body, take a deep breath, drop your consciousness into your heart. Breathe into your heart, listen to it beat. Next, put your hands on your head, cradling your head, one hand on your forehead, other head on the back of your head. Now, imagine that the blood flows from the back of your head to the front of your head, feel the warmth, visualize the healing light and breathe. These of course will not work very well, if you are super angry or have some incredibly intense emotions, but with something as simple as releasing stress given in the above mentioned example it will work. In the meantime, stay centered, stay away from what triggers stress response and choose consciously what you expose your brain to.